Internet traffic monitoring firm CR-Nielsen has released its February 2010 report on the Chinese online display advertising market. 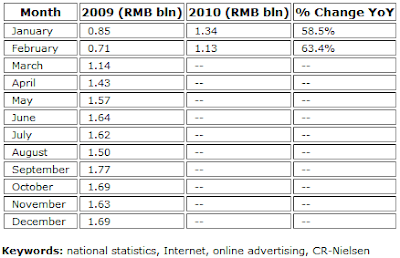 According to the report, the Chinese online display ad market was worth RMB 1.13 bln in February, up 63.4% year-on-year. Apparel overtook automobiles to become the top online advertising industry while automobiles and retail ranked second and third, with spending dropping in the latter two by 44.5% and 28.4% from January, respectively. Among the top ten online advertising industries, spending fell across the board with the exception of fashion, finance and fast-moving consumer goods (FMCG), which respectively grew by 9.6%, 6.8% and 8.7% from January. Chinese online clothing retailer Vancl, Chinese B2C mail-order e-commerce site operator Mecoxlane, Shanghai-based fashion and Standard Chartered were the three largest online advertisers, spending approximately RMB 50.8 mln, 50 mln, and approximately 40 mln, respectively. This is going to be an exciting year for online advertising as its expected that more money will be pouring into online as the total subscribers both online and mobile is at all time high and still growing month after month.